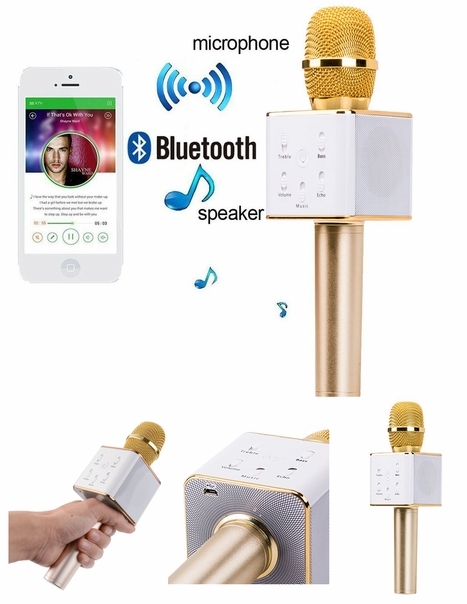 A handheld condenser microphone with a portable mini home KTV player ; Ideal for music fancier, allows you to sing and record you voice anywhere, such as in car travelling, BBQ, family dinner and outdoor party so on; Fit for singing, instrument recording, interviews, podcasting, etc. Can be also used as portable bluetooth speaker. Featured with the Bluetooth and the 3.5mm audio jack, allow you wirelessly or using the audio cable( included) to connect the unit effortlessly to your smart phones like iphone and android phones, computers, ipads, or tablets for hours of enjoyable entertainment. High compatibility, fit for computer, smartphone, iPhone, iPad, MID, audio player with 3.5 aux in jack. 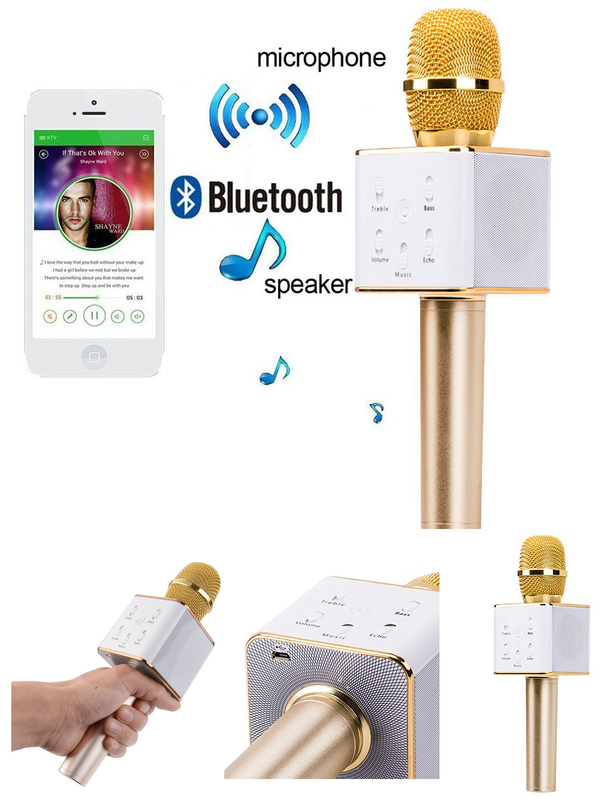 Multipurpose: Bluetooth speaker, Karaoke singing, Car Stereo, instrument recording, interviews, podcasting, etc. Ideal for all vocal applications from singing to speech and usable as bluetooth speaker. With the karaoke speaker you can instantly create your own Karaoke fun anywhere you like. For the budding singer there’s no better way to show off to your friends and bring some X-factor magic to your life because if you’ve got talent then why not flaunt it. Get into the party mood and sing till you drop with the Q7 Bluetooth Microphone and Speaker. This is the latest in portable music entertainment as it will let you play music direct from your Smartphone or other Bluetooth enabled Device.